How do you clean the balls? Easy! 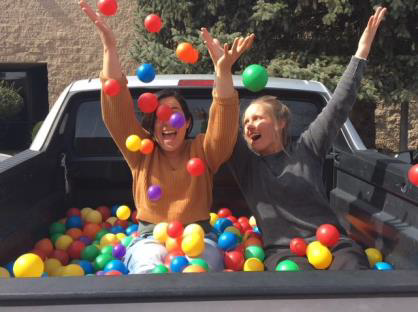 Just ask Kaity and Rachel to fill the bed of a pickup truck with the balls, then race off to the carwash for a quick sanitizing rinse. This large, walled container of brightly colored balls is an enticement for all who see it. It is one of the most versatile therapy tools in our sensory integration gym. Imagine being submerged in the balls, which provide a deep-pressure sensation and a sense of calm. Gross and fine motor skills, sensory-motor skills, social interactions, speech and language development, and symbolic play are just some of the domains we can work on while in the ball pit. Our OTs, psychologist, and speech therapists all find the ball pit to be a staple activity from which hundreds of games and interactions can develop. If you are driving near DFX, stop by for a minutes of calm in our ball pit! Friends sharing a moment in the ball pit.